There is nothing like a summer tomato. If you are anything like me you anxiously await the arrival of local tomatoes at your grocery store or farmers market. This year I have a generous home grown harvest from my backyard garden. As tomatoes become plentiful you may be looking for some tasty recipes. This grilled tomato recipe is wonderful because it can be made ahead of time. Grilled marinated tomatoes can be served hot, cold, or at room temperature. What's better than that? I especially like these grilled tomatoes as one of the yummy vegetables on my marinated vegetable platter. The vibrant color of the tomatoes makes the platter pop visually. Grilled Marinated Tomatoes are quick to make. Just four or five minutes on a screaming hot grill and your tomatoes will begin to collapse and give up their juices. 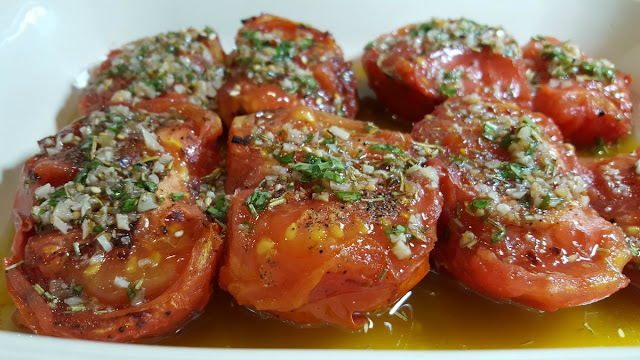 The combination of firm and soft tomato flesh topped with a garlicky, herb marinade is a delicious side dish. Preheat your grill. Combine the olive oil, vinegar, basil, garlic, salt and pepper in a small bowl. Stir to combine. Set aside. Place the tomatoes, cut-side down, on the grill. Grill until they start to bubble and blister, 4-5 minutes. Carefully turn the tomatoes over and grill for two minutes more. Remove the tomatoes from the heat. Place the tomatoes cut-side up in a serving dish. Spoon the marinade over the tomatoes while they are still hot. Set the dish aside for at least one hour before serving, or cover and refrigerate for up to five days. Serve these tomatoes in place of a salad as a tasty summer side dish.